Listed below are the birds we currently have available at YBC's home coop. Let us know if you are interested in any of the birds listed here and if you don't see what you're looking for, send an email to TheChickeness (at) gmail (dot) com detailing the qualities or breed you are interested in, what age, and what your current setup is like if you already have one, and I'll let you know if I can find it and when. Thank you! 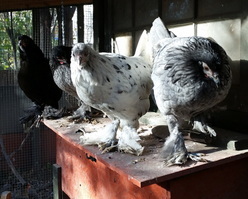 Large-fowl cochin hens - three available, $75 each. Hatched 21 Apr 2015. Kid-raised, so very sweet and relatively tame. We currently have one each of blue, buff, and black. Black Australorp hen, "Matilda" - $45. Hatched 4/9/13, 3-year-old Matilda has revealed herself as a bit of a "problem child" (little did we know when we named her that it would be so appropriate!). She came to me as a week-old chick, and has now lived with three of my clients' flocks over the past 3 years in the hopes of finding a situation that worked for her, but alas her tendency to feather-pick her flockmates leads me to believe she needs a situation where she can free range with her flock, thus having plenty of things to keep her active mind occupied all day, or perhaps a flock with a gentlemanly rooster that will help keep her a bit more in line (though her pecking is fairly subtle, so I'm not certain that would do the trick). She is fairly tame and very sweet, and is still a very solid layer, so I hope we can find the right home for this darling girl! SOLD: "Noir", "Dove", "Blue", and "Berry" - Breda hens hatched 5/3/14, $100 each. Noir (black) and Dove (splash) are two of my favorite gals, who are nearly inseparable so ideally will go together (maybe also with Blue, if possible!). They are super sweet and inquisitive (You have treats? ), and Dove especially loves to explore on top of whatever structures are available. Berry is more of a loner and has a slightly more dominant role in my flock (she's also a little more camera-shy). These gals are VERY winter-hardy and are good layers of extra-large, white, round-shaped eggs. SOLD: "Miranda" - American Game hen, age unknown (she was a stray! ), $75. Miranda is a plucky little gal, who is very skittish and NOT a good fit for a smaller urban flock (less than 10 birds) that stays contained most of the time. 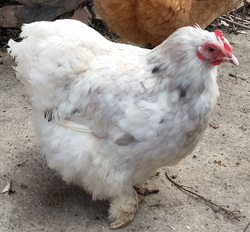 Ideally she'll go to a home with a slightly larger flock and plenty of space where she can do her own thing. 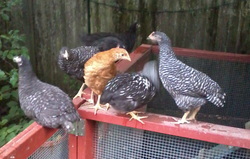 *Blue Breda pullets, hatched 5/3/14 - two pullets available, preferably will go together. 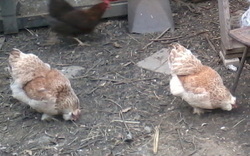 SOLD: Salmon faverolle hens, hatched June 2012, two available. These sisters were bred within an hour and a half of Boston by a friend of mine and have been living here at The Menagerie since the beginning of April. Like all of my friend's faverolles, they are sweet, fluffy, calm-natured girls who lay gorgeous light brown eggs. In my experience, the following breeds are commonly available in this region, meaning I could get them for you from local breeders and hobbyists with little advance notice depending on the season (each name links to the related "breed info" page on MyPetChicken.com): Rhode Island Reds, Barred Rocks, Buff Orpingtons, Silkies, Ameraucana, Easter Eggers. Breeds that are less common, but that some breeders in the area are working with and therefore ones I could get for you given some time are as follows: Salmon Faverolle, Belgian Bearded d'Uccle, Cochin (bantam and large fowl), Marans, New Hampshire Red, Polish, Phoenix, Wyandotte (bantam and large fowl). I can probably track down nearly any other breeds or color varieties that are available in this country, so let me know if you're looking for something more rare and I'll let you know if it exists in our country (many of the more unusual color varieties are only available in the UK or New Zealand/Australia), and when I could have some for you!